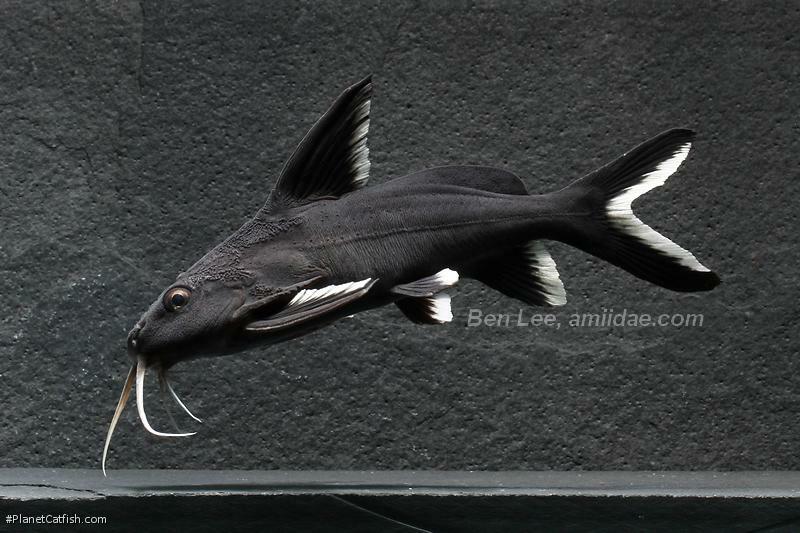 Few catfish have acquired more mystique than the majestic Synodontis granulosus, one of six described Synodontis species endemic to Lake Tanganyika. In part, this mystique reflects the princely price the fish commands. When available, it is often the most expensive fish on vendors' sales lists. Whereas the prices of nearly all once-expensive catfish have deflated rapidly over the last decade, the going rates for S. granulosus have come down only slightly, dropping from around US $500 as recently as early 2000 to about $300 today (and about 300 in Europe). If you are going to pay several hundred dollars for a fish, you'd better earn lots of bragging points with your fish buddies. And have a good explanation for your spouse! A second reason for the high price and mystique of S. granulosus is that the fish is relatively uncommon in the wild. 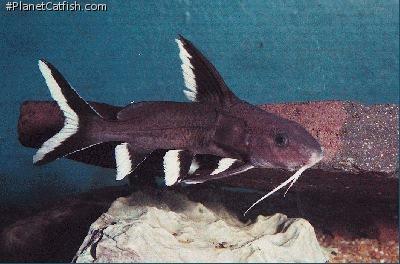 Unlike many Lake Tanganyika Synodontis, it is a loner, and thus impossible to catch in large numbers. Moreover, it is found in deep water (about 50 meters) at some distance from the shore. Until a few years ago, this was beyond the limits of existing diving technology and the fish were mostly caught in gill nets, a low yield method which restricted the volume of exports. As a result, only 20-30 fish were exported from the Lake each year. Better diving technology has changed this situation, and it appears that many hundred fish are now shipped out of the Lake annually. Whether this is a sustainable level remains to be seen. There is already some evidence that the rocky habitat of S. granulosus is under growing ecological pressure. The third and best reason for the extraordinary mystique of S. granulosus is that it is truly an exceptionally elegant and intelligent fish that quickly becomes the cynosure of any Tanganyika tank. The body is brown-black, shot with a purple sheen and highlighted with bright white barbels and bright white edging on the posterior borders of its fins. Although not evident at first sight, close inspection reveals that the skin of the whole body, including the adipose fin, is covered with small, closely set granular papilla (hence the name "granulosus"). Most specimens are imported at a size of 12-18 cm, but mature adults can reach 25 cm SL. S. granulosus quickly learns who the "Food Guy" is and will swim up to be fed by hand. Every time I put my hand into its tank, my "granny" comes and nibbles at it! (It tickles, but unlike the nipping of S. polli, which sometimes do the same thing, doesn't hurt. My three year old daughter asks, "Daddy, why does this fish keep licking you?") Many aficionados of Tanganyika fish keep their S. granulosus with herbivorous fish like Tropheus, and are still able to supplement their diet with meaty fare by hand feeding them. They have a keen sense of smell and are usually the first to get at food. When I feed my Tanganyika tank, my granny races across the surface, upside down in classic Synodontis-style, vacuuming up everything she can. Most specimens are voracious eaters and can easily become overfed in community tanks. If S. granulosus has a fault, it is gluttony. In smaller tanks, S. granulosus tends to be both reclusive and aggressive towards other Synodontis, especially conspecifics. Females tend to be a bit larger and more aggressive than the males. If you are lucky enough to keep several S. granulosus, it's best to keep four or more in order to spread out aggression. Some specimens are bolder than others, but almost all will become the life and soul of the party if kept in a tank of 125 gallons (about 500 liters) or more, with lots of rockwork, ample open swimming space above the rocks, and the company of schools of other Lake Tanganyika Synodontis species. 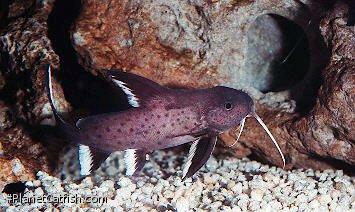 Adult S. granulosus are easy to identify, unlike the other five Synodontis species endemic to Lake Tanganyika. Moreover, the taxonomic status of S. granulosus is so clear that in the 103 years since it was first described by George Boulenger in 1900, not a single synonym has been introduced. By comparison, taxonomic confusion still swirls around the identities of other Lake Tanganyika Synodontis such as S. petricola, Matthes, 1959, which clearly needs to be divided into multiple separate species, and to a lesser extent, S. tanganaicae and S. dhonti. The distinctiveness of S. granulosus is easy to see in the Venn diagram at the right. Some Tanganyika Synodontis are granulose, like S. granulosus (though to a lesser extent), but all except S. granulosus are distinctly spotted. While the diagram accurately describes Tanganyika Synodontis as typically seen in the aquarium, in fact, it's not quite that clear cut, because juvenile and sub-adult S. granulosus also have spots (not to mention the fact that all six endemic species have white fin edging to some degree). Indeed, very young granulosus have a color pattern that, to the untrained eye, could easily be mistaken for S. multipunctatus! In the picture below of a sub-adult specimen, faint spots can still be seen. Moreover, fully mature S. dhonti and S. tanganaicae lose their spots. This illustrates a general fact about the entire Lake Tanganyika Synodontis species flock: fry and juveniles of all endemic species look very similar: the distinctive characteristics of each species only become fully apparent as the fish reach adulthood. Could this be the reason that very young wild-caught S. granulosus have apparently never entered the trade? In any event, little is known about S. granulosus' spawning habits, and the fish has never been spawned naturally by aquarists. While it has been bred by hormone injection in it While it has been bred by hormone injection in the Czech Republic, it is reliably reported that these artificially spawned fish are the result of hybridization by unscrupulous breeders and lose their resemblance to true S. granulosus as they mature. Given the limited numbers of S. granulosus in the wild, its apparently threatened habitat and its extraordinary elegance and charm, it is only to be hoped that future captive breeding efforts can lead to the emergence of a healthy and sustainable tank-raised population spawned without recourse to artificial hybridization. Planet Earth would shine less brightly were thi elegant fish to disappear. Special thanks to Greg Pierson for his major contributions to this article.